I have a few entries today. The first comes from Christmas day when we volunteered at the town community center. 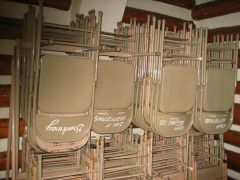 I took a picture of the rack of folding chairs because hand painted on the back of each chair is a sponsor who paid for the chair. Some are people’s names or business names. These folks really “own” the community center unlike back home where everything is paid for through and controlled by local government. As such, the community center also puts signs out for Thanksgiving and Christmas with Bible verses stating the values of the community. I like that! My next feature shows how spoiled we are here. The first shot is my neighbor’s driveway. 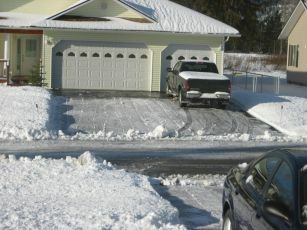 As you can see the plow came by and put a blockade of snow on the end of his driveway. Not to worry. 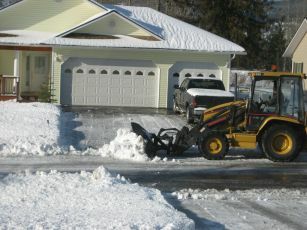 Minutes later the tractor comes by and cleans things up. Yes, life is good here in spite of the snow. This entry was posted on Sunday, January 7th, 2007 at 9:16 am and is filed under OOSTL. You can follow any responses to this entry through the RSS 2.0 feed. Both comments and pings are currently closed.